A timber finish on any surface has an ageless and elegant appeal. Current architectural trends observed by Fairview indicate that woodgrain finishes are very popular in decorative cladding. Jonathan Baker, a member of Fairview’s sales team, explains that there are several advantages to using imitation woodgrain finishes. Unlike natural wood, imitation woodgrains are low maintenance and require no additional coating. They won’t age or warp, delivering more stability than solid wood. Imitation woodgrains offer an affordable solution to get a natural wood finish without the cost of sourcing expensive timber. The broad range of colours and styles in imitation woodgrains provides almost endless options for architects when creating their designs. Also, most natural timbers do not have the fire-retardant capabilities of imitation woodgrains. 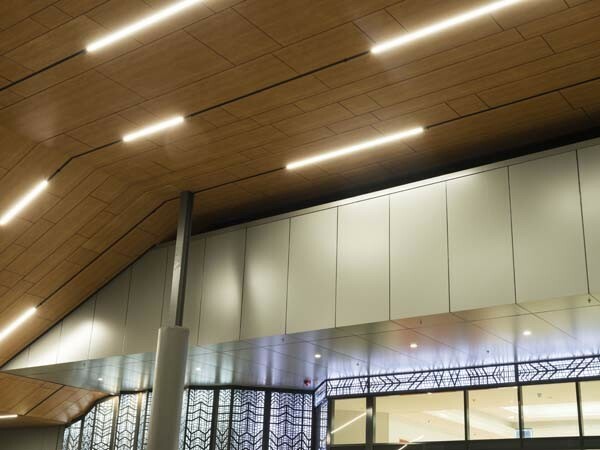 Fairview’s woodgrain finish ‘American Pine’ was recently installed in a unique pattern for the $50 million Aspley Hypermarket shopping centre. Designed by architects ThomsonAdsett, the shopping centre features Vitracore G2 and Vitrabond FR composite panels in American Pine finish to provide a compliant option that would not fade, warp or require extensive maintenance. The unique pattern on Fairview’s American Pine helps achieve an authentic timber look with the assurance of low maintenance. Vitrabond FR panels, also in a woodgrain finish, were used for an apartment tower in Sydney to meet the architect’s brief for a timber balcony surround that wouldn’t weather or require continual maintenance.